Ministers blame Abbas's 'mechanism of murder' in UN incitement against Israel in murder of a young couple in Samaria. Israeli ministers lost no time in condemning the Arab terror attack just outside of Itamar in Samaria on Thursday night, connecting it with Palestinian Authority (PA) Chairman Mahmoud Abbas's UN speech the day before in which he announced the PA is abandoning the Oslo Accords. In the attack a young couple in their thirties were murdered in front of their four children, as their car was shot at by the terrorists. 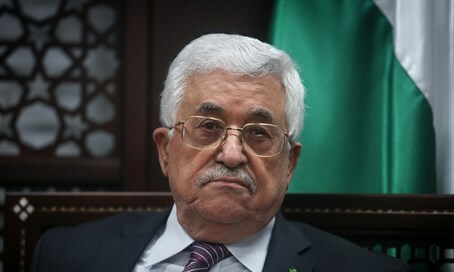 Deputy Foreign Minister Tzipi Hotovely (Likud) said "Abbas is inciting and the on the ground they are incited, and this is how the murderous mechanism that motivates murderous terror attacks in Judea and Samaria works." "This type of incident is more proof that the Palestinians do not want peace but rather hatred, not dialogue but rather incitement and hatred. I strengthen the hands of the security forces in their search after the lowly murderers." Also blaming Abbas was Agricultural Minister Uri Ariel (Jewish Home), who said, "this murderous incident that leaves behind a family orphaned of its parents is an outcome and direct continuation of Abbas's mask of lies at the UN yesterday." "The responsibility is his, and his alone, and he must give an accounting for it. The response to the awful murder must be the annexation of Area C, an expansion of the settlement in Jerusalem, Judea and Samaria," he said, calling for the myriad of blocs under full Israeli control in Judea and Samaria to be annexed. Culture Minister Miri Regev (Likud) issued a response as well, saying, "24 hours after the violent speech of the arch-murderer Abbas, a husband and wife were murdered in Israel." "In his every word Abbas encourages the murder of Jews and permits their blood," she continued. "He inherited the path of (Yasser) Arafat and continues his criminal way that snatches the lives of innocents." "This is painful evidence that Israel must take harsher steps. I intend to press for that in the coming government meeting," said Regev, who asked to send her condolences to the family of the murdered. "The order of battle of Abbas was implemented this evening in Israel, and it is red with blood," said Education Minister Naftali Bennett (Jewish Home). "A people whose leaders encourage murder will never have a state, and that must be said clearly." "The time for talking is over, the time for actions has arrived," he added, without specifying any particular actions. MK Bezalel Smotrich (Jewish Home) reacted to the attack and said: “The shooting terror attack is a direct continuation of Abu Mazen's (Abbas's) campaign of false incitement, and the blood of the murdered victims is on his hands. It is time for the other shoe to fall in the Prime Minister's mind as well, and for him to stop talking about the idiotic idea of two states for two nations. Only ending all hope for a Palestinian state will cut off terror."